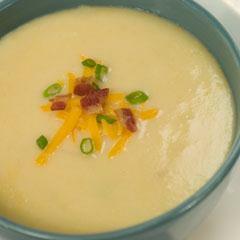 Enjoy this potato soup recipe, which is simple to make yet substantial. Melt Country Crock® Spread in 4-quart saucepot over medium heat and cook onion, stirring occasionally, 5 minutes or until tender. Stir in potato, milk and broth. Blend with a hand mixer until smooth. Bring to a boil over medium heat, stirring occasionally. Remove from heat and stir in 1/2 cup cheese. Cover and let stand 2 minutes; stir until smooth. Season to taste with salt and black pepper. Sprinkle with remaining 1/2 cup cheese and serve, if desired, with crumbled bacon, chopped green onions and sour cream. *Try using microwaved or boiled mashed potatoes.